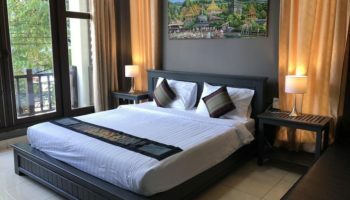 With its many Buddhist temples and shrines, the northcentral Laotian city of Luang Prabang certainly lives up to its name, which translates as “Royal Buddhist image.” Though it has a population of less than 60,000 people, the city has a lot of offer travelers. 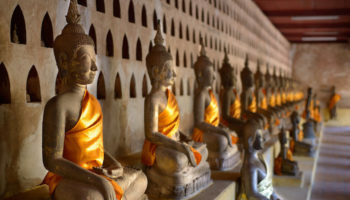 In addition to the most important monastery in Laos, visitors will find several major temples (the city has 80 temples). 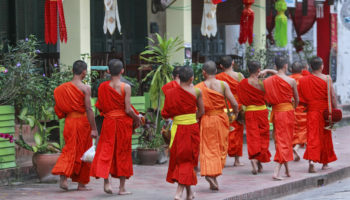 They’ll also be able to see monks quietly walking the streets in the early morning hours gathering alms. When nature calls, there are two waterfalls that offer great swimming in the country. 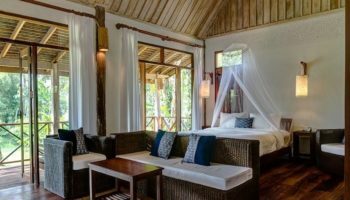 Here’s a look at the top tourist attractions in Luang Prabang. Tad Sae Waterfalls doesn’t get as many visitors as other Laotian waterfalls, though it’s quite popular with locals. It’s a bit harder to get to, involving a tuk tuk to the Nam Khan River and then a 10-minute boat ride. The main reason people visit the cascading waterfalls is for the swimming; it’s nicer than other waterfalls, plus offers an opportunity to swim with elephants. 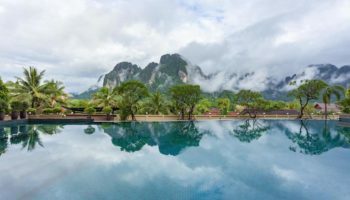 Tad Sae Waterfalls, located about 19 km (12 miles) from Luang Prabang, is best visited in the rainy season (August to November) when the water is high; other times the falls are non-existent. Modest swimwear is recommended; locals swim fully clothed. Laotian cuisine isn’t as well known as other Asian cuisines. Cooks who want to add a new dimension to their meals when they return home may want to take a cooking course at the Tamarind restaurant. Day classes begin with a market tour where students learn about ingredients making up Laotian cuisine. Then it’s back to the school to cook dishes utilizing traditional Lao techniques. This includes pounded or smashing with a mortar and pestle, and cooking over an open fire. Dishes include jeow, a traditional spicy dipping sauce; Mok Pa, a fish steamed in banana leaves, and a minced meat salad called Laap/Koy. As the name implies, the Traditional Arts and Ethnology Centre is a good place to see artisans practicing traditional arts and learn more about the ethnic groups inhabiting Laos. The center’s goal is to celebrate and preserve the heritage of the various ethnic groups. Since Laos has 80 ethnic groups, the center makes learning about their heritage in one place convenient. Visitors can watch demonstrations on making traditional arts and crafts then head over to the boutique to buy crafts made by ethnic groups around the country. 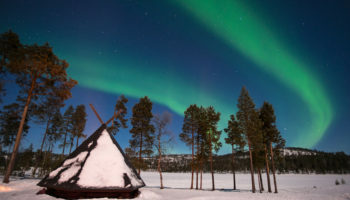 Open only since 2007, the center is gaining in popularity with visitors. As palaces around the world go, the Royal Palace in Luang Prabang isn’t very old nor was it occupied for very long. The palace was built in 1904 for the Lao royal family during French colonial days. The communists overthrew the monarchy in 1975 and converted the palace into a museum. 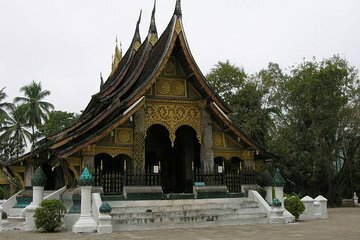 The palace is a mixture of Lao and French architectural styles. Décor is traditional Lao. One room contains gifts presented to the king by foreign countries; they are grouped by a nation’s politics: socialist and capitalist. Exhibits trace the history of Laos back several centuries. A 2,000-year-old 71-meter (232-foot) high Buddha is located here. Every morning beginning about 5:30, meditating Buddhist monks walk the streets of Luang Prabang seeking alms. As the robed monks walk in silence, people place bits of food, particularly sticky rice, flowers or other offerings in their bowls. Since there are 80 temples in the city, early-rising visitors can see this procession almost anywhere, though the most popular viewing locations are Th Kamal and Th Sakkarin. Unfortunately, officials say this tradition is in danger of being cancelled because of unruly tourists. They suggest tourists should behave and dress appropriately since the procession is a religious ritual not a photo op. Buddhist cave art is really popular in Asian countries. Mostly the Buddhas are carved into the caves, but at Pak Ou Caves they’re carved out of wood or stone and then placed inside the caves. The two Pak Ou Caves are actually a sanctuary for Buddhas, a place where damaged Buddhas are put out to pasture. More than 6,000 retired Buddhas of every imaginable size, shape, position and composition can be found within the caves; it’s an accumulation of several hundred years. 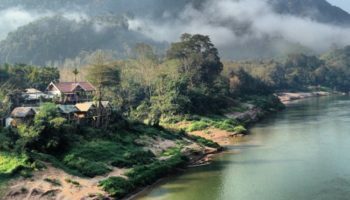 The caves are located in a scenic spot along the Mekong River about 24 km (15 miles) from Luang Prabang. Travelers need to dust off their best haggling skills when they visit the night market in Luang Prabang. That’s because vendors frequently quote higher prices than stores open during regular day hours. They do this knowing they aren’t likely to get their original asking price. The night market offers diverse goods such as apparel, ceramics, ethnic arts and crafts, homemade whisky, hand bags and bamboo items. The city’s main night market, open from 5 p.m. to 11 p.m., begins at Wat Mai and stretches along Sisavangvong to the town center. Travelers looking for street food will find it mostly at the market’s end. Mount Phousi, located inside the city of Luang Prabang, isn’t really a mountain: It’s a 140-meter (450-foot) high hill that is home to several Buddhist shrines and temples. It’s a good place to watch the sun rise or set over this Lao city. 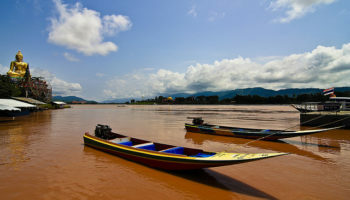 Mount Phousi is between the Mekong and Nam Khan rivers. Travelers must climb several hundred steps to reach the top but the climb is manageable for most people if they take it slow and easy. It’s recommended visitors take different routes up and down the hill. Notable temples are Wat Tham Phousi with its big reclining Buddha and Wat Chomsi at the summit. Built in the mid-16th century between the Nam Khan and Mekong rivers, Wat Xieng Thong, or Temple of the Golden City, was the place where centuries of Laotian kings were crowned. It’s considered the most important monastery in Laos today. More than 20 buildings serving various religious functions make up the temple complex. The architecture is stunning, with lots of gold leaf used. 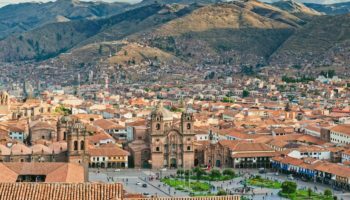 A mosaic tree of life, statues of deities and an 25-meter (82-foot) high funeral carriage are just some of the goodies visitors will see. The complex has been restored several times over the centuries, but some original buildings remain. 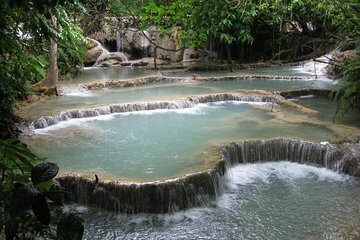 Located 30 km (18 miles) south of Luang Prabang, Kuang Si Falls makes a good day trip to explore nature in the countryside. 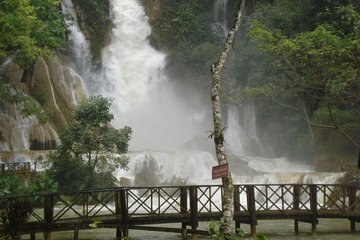 The falls, the biggest in the Luang Prabang area, are three-tiered, with the biggest fall 60 meters (200 feet) high. Getting to Kuang Si Falls involves walking a maintained trail. Once there, visitors can cool down with a dip in turquoise lagoons as they cascade along the way. Energetic visitors can climb to the top for a look down at the falls. The way is slippery, so proper footwear is essential. The falls are a good place to escape city heat since temperatures are cooler here.